One drama, two versions. In both the protagonist dies, but the reasons given for her death differ significantly. Tomorrow, Sunday marks the 25th anniversary of Pasang Lhamu Sherpa becoming the first Nepali woman to reach the 8,850-meter-high summit of Mount Everest. The triumph ended in tragedy. 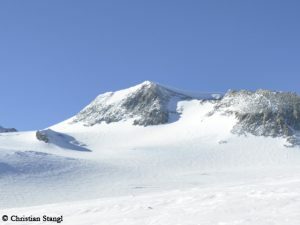 The 31-year-old mother of three children subsequently died on the descent on the South Summit. 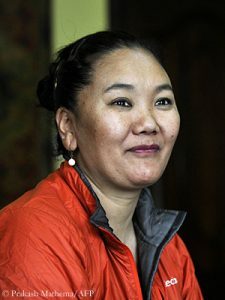 According to the official Nepalese version, Pasang Lhamu lost valuable time on 22 April 1993 because she helped her teammate Sonam Tshering Sherpa who suffered from high altitude sickness. In addition the weather turned bad, it was said. A report written by the (recently deceased) legendary Himalayan chronicler Elizabeth Hawley, published in the American Alpine Journal, has a distinctly different tenor. According to her, Pasang Lhamu was known as a very slow climber. 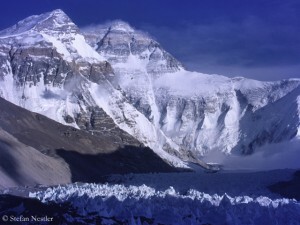 It had taken the team 14.5 hours from South Col to summit, Hawley wrote. Normally ten hours are estimated for this section. In Hawley’s words, Pasang Lhamu was so weak at the highest point that the other team members had to drag down her and Sonam Tshering, who was already coughing up blood, from the main to the South Summit, 100 meters below. It took them four and a half hours. Then their last supply of oxygen ran out. According to Hawley, the next day other team members tried to bring up full oxygen bottles from the South Col, but fierce winds drove them back. 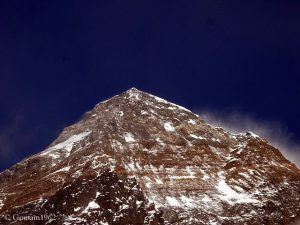 It was not until two and a half weeks later, on 10 May, that another Sherpa was able again to reach the South Summit, where he found Pasang Lhamu dead – sitting in the snow, with her back to the 40-degree slope. Sonam Tshering’s body remained missing. Unusual for that time, Pasang Lhamu’s body was recovered and brought down from an altitude of 8,749 meters. The dead climber was laid out in a stadium in Kathmandu before cremation, thousands of people paid their last respects to the Sherpani. She had “proved that Nepali women are also endowed with such tremendous courage,” the then Prime Minister of the country wrote in a message of condolence to her family. 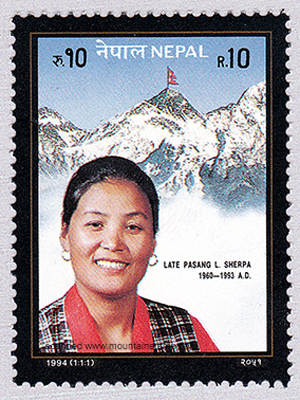 Pasang Lhamu Sherpa became a national heroine and a legend. Stamps with her picture were issued. Roads and schools are named after her – since 1996 a mountain too: the 7350-meter- high Pasang Lhamu Chuli, better known as Jasemba. Even today, every kid in Nepal knows the climber’s name. Although her Everest ascent may have been a little less heroic than many Nepali think, Pasang Lhamu Sherpa was a pioneer after all. She bent over backwards to reach her goal of becoming the first woman in her home country to reach the highest of all summits. 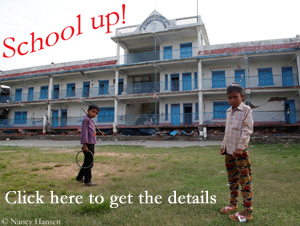 In the three previous years, Pasang Lhamu had failed three times. In her till then most successful attempt in 1991 as a member of a French expedition, she had had to turn around at 8,700 meters, just 50 meters below the South Summit. For Pasang Lhamu, it was not just about absolute commitment to reach a summit. As a climber she also fought for the equality of women in Nepal. ““Men are considered heroic [for climbing] while women are called irresponsible,” Pasang Lhamu once complained. This year’s spring season in Everest proves that her message was not allowed to fade away and that in contrary the seed has germinated. Just on the south side of Everest, more than a dozen Nepali women climbers will tackle the highest mountain on earth. 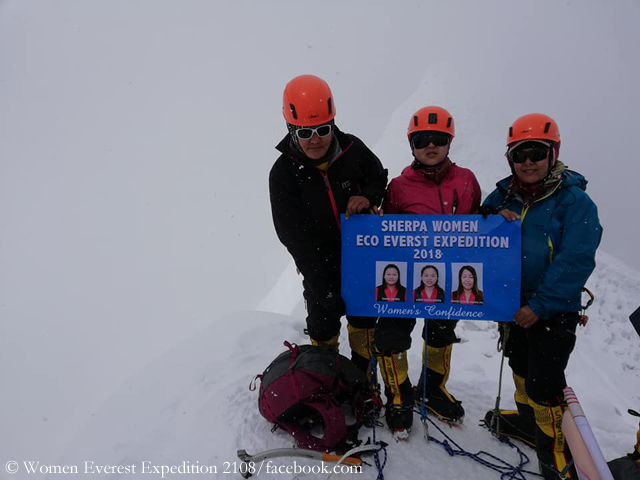 So the “Women Everest Expedition 2018” of the 30-year-old Lakpa Yangji Sherpa, Pasang Lhamu Sherpa “Phinasa”, aged 37, and the 25-year-old Yangdi Sherpa is themed with the slogan “Women’s Confidence”. 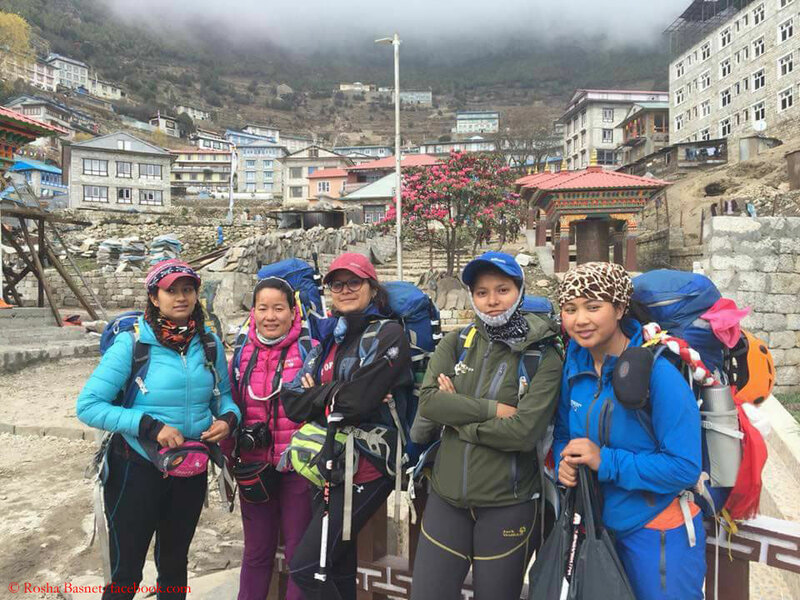 The expedition is “a great platform to raise the voice for women and their rights and empowering them,” writes Pasang Lhamu. This week the three women scaled the 6189-meter-high Island Peak near Everest to get acclimatized. 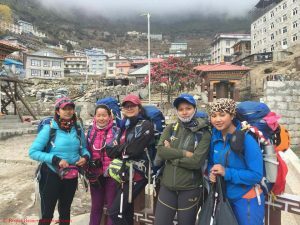 At the same time, the members of the “First Women Journalists Everest Expedition 2018” are still on the trek to Everest Base Camp. The Nepali journalists Kalpana Maharjan (33 years old), Rosha Basnet (29), Rojita Buddhacharya (26), Deuralee Chamling (35) and Priya Laxmi Karki (27) want to set an example for the “the equality of all people, undifferentiated by race, caste, community, or gender”. 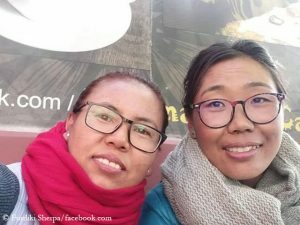 Lhakpa Sherpa can climb Everest without messages, because she herself is a message: that women can not only succeed on Everest, but can even do it in series. With eight summit successes, the 44-year-old Nepali, who lives in the US state of Connecticut, is already listed in the Guinness Book of Rekords as the woman with the most Everest ascents. This spring, the mother of two daughters, aged eleven and 16, wants to climb up again from the Tibetan north side to achieve her summit success number nine. “My body knows that I have already been this high,” says Lhakpa. “It’s like a computer. It figures it out very quickly. My body knows the high altitude. It remembers.” Achieving her first success on 17 May 2000, Lhakpa Sherpa had become the first woman of Nepal who did not only summit Everest but also returned safe and sound to base camp. However, she did not become a legend like Pasang Lhamu Sherpa in her home country, despite this first and her many other Everest summit successes.